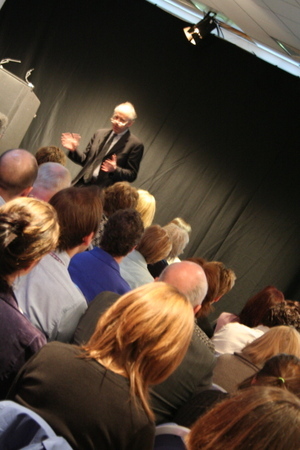 Alan November is currently keynoting at eLive in the impressive Murrayfield Stadium, Edinburgh. I arrived a little late (posting off important wedding stuff to France) but am impressed to be hearing some reframed ideas. After showing off the San Diego classroom where each student has his or her own desk and computer (i.e. their own office), he is now showing off the power of Google and how a search for "miserable failure" turns up the White House and George Bush. Students need taught how to use the internet, how to interpret information and analyse it, not how to use computers. We need to teach Information and Communications, not the Technology. MartinLutherKing.org looks like a decent website to do some research on the great man. It isn't. A quick search on WhoIs.net reveals that a white supremacy group owns the domain. Valuable information or racist nonsense? Bear in mind, this is a website - not a blog, not a podcast, not a social network site. I wonder how many schools block this site in their schools - probably very view, compared to how many block valuable blogs. This is nothing new for edubloggers, of course, who are able to tap into November-like thoughts every day of the year. But this room is full of around 150 educators, most of whom don't have a blog and so it's great to see the message getting through to a new wave of teachers. Just spotted Will, too. And with an email, he's just spotted me. Que la fête commence! And now I've just heard David, too. Who else is in here?!?! Sounds like a great conference. Perfect! In a nutshell. Exactly what I'm trying to get across to my colleagues (only one of whom blogs): Students need [to be ] taught how to use the internet, how to interpret information and analyse it, not how to use computers. We need to teach Information and Communications, not the Technology.